Cheesy Tater Tot Breakfast Casserole – A breakfast casserole that incorporates all of your favorite breakfast foods – eggs, bacon, sausage, cheese, and potatoes. This is sure to satisfy the whole family! Guys! Do you know what week this is? Well, it’s Oscars Week!! I am such a nerd for award shows and this is, by far, my most favorite. It’s full of the biggest stars and some of the best fashion. And not to mention, my favorite movie of 2016, La La Land. It’s supposed to sweep some major categories so I am BEYOND pumped for Sunday night. You’d think this post would be about some super cute, perfectly-themed dish for an Oscars Party. But sadly, I am traveling the next morning so there will be no crazy Oscars partying for this chic. However, you’d be terribly mistaken if you thought I’d let this night go by without some champagne-sipping. It’s already on the grocery list. 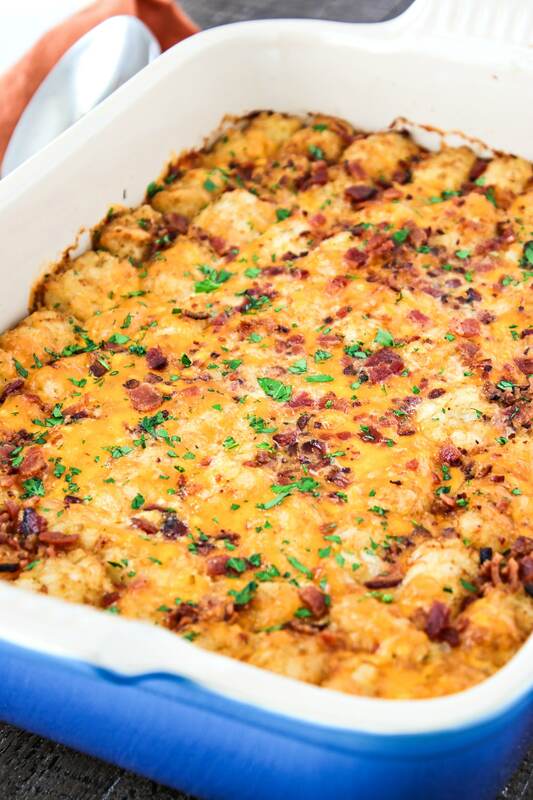 Okay now that I’ve got that out of the way, let’s talk about today’s recipe: cheesy tater tot breakfast casserole. It’s been quite some time since I posted a yummy breakfast dish. Let’s see…I think the last breakfast recipe I shared was the one for this cinnamon roll wreath, which, by the way, Tyson said tasted and looked like a King Cake. Just hide a baby in there and use colored sugars instead of sprinkles and you’re there. Keep that in mind for Mardi Gras next week! Ugh, I keep getting side-tracked. Back to the casserole. With all the Super Bowl treats of January and Valentine’s treats of February, I’ve let my breakfast cooking slip a bit. So now I’m back with a punch. And man, it’s gonna blow your mind. I was really hoping to make hash brown casserole since that’s Tyson’s favorite breakfast dish. If you haven’t tried it, go to Cracker Barrel NOW. However, all the recipes I found were made with condensed soup and that’s not really what I was looking for. Maybe I’ll play around with the recipe and develop one that I’m really happy with. But for now, he’ll just have to wait. In my quest for a hash brown casserole recipe, I stumbled upon this breakfast casserole recipe that used tater tots instead of hashed browns. How genius! The tots looked so crispy and brown as they sat on top of the casserole instead of hidden on the bottom. Plus, it had all of the greatest components of breakfast (eggs, cheese, bacon, sausage, and potatoes) rolled into one. I just had to try this recipe. So. Much. Flavor. My husband LOVED every bite of this dish, as did I. But his opinion is the one that matter here. Breakfast food is his favorite so I couldn’t let him down. This is the perfect dish for families since you can make a ton of food at once. Plus, since there are so many components in this dish, you’re sure to please everyone. For an added punch, you can add some cayenne or chives to the eggs. I didn’t think of that until after it was in the oven, but I’m excited to try some chives next time. I say this every time people: shred your own cheese! Pre-shredded cheese has added preservatives to keep the cheese from clumping. These preservatives prevent you from getting a good melt on the cheese. So I always shred my own. This time, however, I used my food processor to shred for the first time. It took second. SECONDS! I am never shredding by hand ever again. You can find one pretty cheap nowadays. But make sure it has a grating plate. Here is the food processor I have. The recipe calls for a 9×13 casserole dish but I love using my 9×12 Le Creuset dish because of the awesome handles on it. However, since there is one less inch of length in this dish, the casserole is a little thicker and, thus, needs to cook longer. So make sure to adjust if you have a smaller dish, too. The casserole is done when the center isn’t jiggly anymore. I used hot sausage for my casserole. I really don’t like spicy food but it doesn’t make the casserole spicy; it adds the right touch of flavor. So give it a try! Make sure to keep the tots frozen until you add them to the casserole. If they thaw out, they will be mushy after baking instead of nice and crispy. I haven’t tried prepping the casserole, letting it sit overnight, and then baking the next morning. Honestly, it doesn’t take that long to prep in the morning so I don’t think it’s necessary. But if you need to cut out time, cook the bacon and sausage the night before and assemble in the morning.You can even shred the cheese the night before too. Alright guys! I hope you enjoyed reading about this amazing casserole. Now, it’s time to get cooking! Let me know how you like it! A breakfast casserole that incorporates all of your favorite breakfast foods - eggs, bacon, sausage, cheese, and potatoes. This is sure to satisfy the whole family! Set skillet to medium temperature. Add 4 slices of bacon to cook until crispy, about 5 minutes each side. Remove from pan and let cool on two paper towels to remove excess grease. Set aside. Remove excess grease from skillet and dispose. Place skillet back on stove and set heat to medium. Let it heat back up and then add 1 lb of ground sausage to pan. Break it down using your wooden spoon or spatula. Let it cook until browned. Once cooked, strain meat to remove excess grease. Set aside. Preheat oven to 350 degrees. Grab a 13x9 casserole dish and place cooked ground sausage on the bottom. Cover with 2 cups of shredded sharp cheddar cheese. In a medium bowl, mix pepper, onion powder, salt, and eggs together. Whisk until the eggs are beaten. Add milk and whisk together. Pour evenly over the sausage and cheese mixture. Grab the tater tots from the freezer and begin to layer them over the casserole. I didn't need the whole bag but that's because my casserole dish was only 9x12. Place casserole in preheated oven for 35-45 minutes. Mine took about 45 minutes because my dish was shorter and thus made the casserole thicker. So make sure to adjust based on the size of your dish. Grab 4 pieces of bacon and give them a rough chop. Remove casserole from the oven when it's ready. Add remaining 1/2 cup of cheese and crumbled bacon to the top of the casserole. Bake for another 5-10 minutes until the cheese is melted and bubbling. Remove casserole from oven and let it sit for 10 minutes so that it cools down a little. Sprinkle with fresh chopped parsley before serving. Recipe adapted from Chew Out Loud. Can you double the egg? 3 eggs doesn’t seem like enough. You can but it will be more custardy. I haven’t tried this myself so proceed with caution. Had this for Christmas Day breakfast & it was amazing! I had to cook it for an extra 20 minutes though, but the recipe is definitely a keeper! Yay! So glad it went well. Sorry it had to cook for so much longer! It really depends on the baking dish. Mine was probably wider, making the casserole less thick and much quicker to cook. Do you think it would work with just using bacon and not sausage? Yes, I think it would. Since the bacon is just added on top, the casserole would be a little plain in the center without the sausage. So you may want to double the amount of bacon that you make, and place half of it in the casserole and half on top. Let me know how it turns out! i HAVE BEEN MAKING THIS FOR HOLIDAY BRUNCHES AND IT IS A BIG HIT! I ONLY USE BACON. LAYER IT ON THE BOTTOM INSTEAD OF THE SAUSAGE AND THEN ADD IT ON THE TOP WITH THE CHEESE AT THE END! IT IS AMAZING! This seriously looks like a dream!!! Thank you for sharing this amazing recipe! P.S Love your pictures and your whole site – it’s gorgeous! My son would go crazy for this! He loves these kinds of cheesy potato casseroles. Love how easy this is to make. This looks soooo yummy!! It would be a great casserole for a ton of people in the morning. Ohhh we love tater tots, my granddaughter gobbles them up as fast as you can give them to her 🙂 I will have to make this on one of the days I babysit her! This looks like absolute heaven! My friends would love this on brunch day – especially with a little hangover! This is scrumptious breakfast. Your images are making me drool. I cannot wait to try this recipe at my home and serve it to my family. Thanks so much! Yeah, not many people know that. I learned that by watching a cooking show. Glad to pass on the knowledge! Yummy!! If I had this, I’d eat breakfast EVERY morning!! This looks like my kind of breakfast. Pinning! This looks good and I always love a good breakfast casserole. I’ll have to try to this out soon. I have done this with hash browns on top but never tutor tots. Feeds a ton of people. These look heavenly!! I love tator tots and I love casseroles so throw them together in one dish and I will likely LOVE it too. On a side note, I love the pictures you take on your blog! What camera do you use? Hi Divya! Thanks so much for the compliment! That means a lot to me. If you’re looking at pictures prior to Jan 2017, they were taken with my first camera, a Canon Rebel T3 (a very basic model). The new version of the Rebel is the T6. If you’re looking at pics Jan 2017-present, they were taken with my new Canon 80D body with a Canon 35 mm wide angle lens f/2.0. Hope that helps! casseroles are one of my favorite things to make for dinner because the leftovers can be breakfast! So true! I love this idea! This looks so yummy!! I’d probably eat this for dinner as well. Heck yes! Breakfast for dinner is the best!